3D Cute Animal Design Backpack Kids School Bags For Girls Boys Cartoon Shaped Children Backpacks. 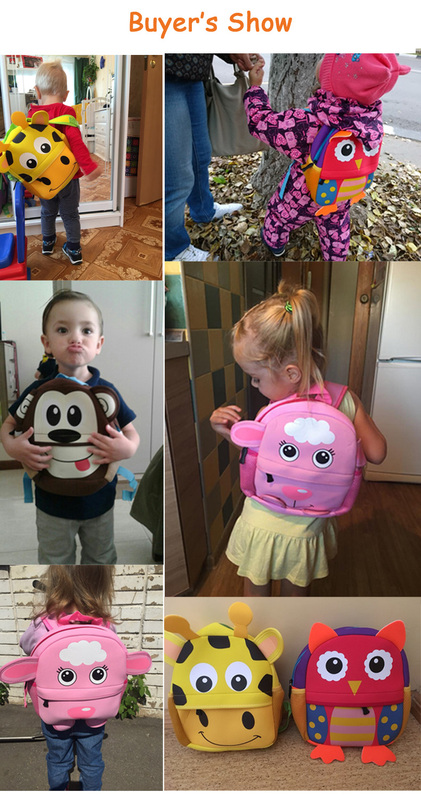 Do you want to buy a comfortable, waterproof and practical bag for your girls or boys ? Here is the right bag! It is soft, so, it will be comfortable for kids. It is waterproof, so, don't worry water or rain again. It is environmental, pass all of necessary certificate. It's very safe! It is durable .Your kids can use it for a long time. It is very cute. Your kids will love it. It is easy washing and fast drying, very easy to clean. Moms will like it. Money Back Guarantee- Get it, try it, any problems? no worries, we provide a full money back guarantee!Any issue, we will help solve it efficiently. It will be a little smelly at first use. Please unpack it,it will be gone after several hours.